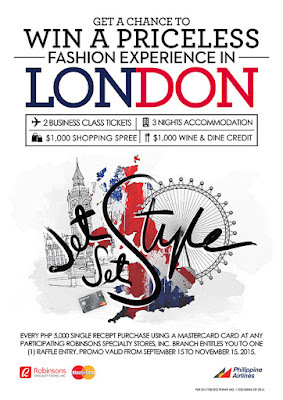 Robinsons Jet Set Style London ~ Philippine Freebies, Promos, Contests and MORE! Grab your chance to win a priceless fashion experience abroad in Robinsons Jet Set Style London promo. Swipe at least P5,000 using your MasterCard at any participating Robinsons Specialty Stores, Inc within the promo period. This entitles you to one raffle entry. Fill it out with your contact details and drop in drop boxes found at the counter of each participating branch. Submit as many entries as you can for more chances of winning an all expense-paid experiential trip to London, England for two (2) inclusive of FREE roundtrip business class tickets + 4 days/3 nights accommodation + USD1,000 shopping spree in London (at Topshop, Topman, Miss Selfridge, Dorothy Perkins, Burton, Warehouse and River Island) + USD1,000 wine and dine credit + Priceless London Package (professional makeover, shopping experience with a stylist, photo shoot around London’s iconic sites, dinner at a Michelin Star restaurant, traditional English high tea) + P20,000 shopping GCs valid at all partner merchants in the country. Nine (9) minor prize winners will also be drawn and will receive P10,000 GCs which they can redeem at any participating stores nationwide.